The build quality is ok to decent. It is made of plastic, and not with any flair to it. Its made to be a budget device, part fit is not very exact. Other higher cost options may be plastic as well, but usually fit together better from the ones I handled at Cabela’s during my initial looking. The display is a black LCD type, optic quality affected the crispness a small amount, but nothing preventing even the weakest eyed among us from using it once the optics are focused. It has a simple box aiming reticle that pops up when you power on the unit. The reticle is about 10moa give or take. It covered up the better part of a fallen log that I was ranging to. So it is not a fine precision reticle… It works well enough inside a few hundred yards, but it is not ideal for longer range use. Measurement speed is slow, taking several seconds to get a reading from first powerup. I would not recommend this for a hunter, as I would imagine that a faster reading would be better for that use. Once it has its initial distance reading, the scan mode updates pretty quickly, so I can range off several objects quickly to use as reference points when downrange placing targets. This Halo rangefinder is very accurate and easy to use and in fact, you will probably not even need to use the manual as you will quickly figure out things. It takes longer and be a little more finicky to get a distance. 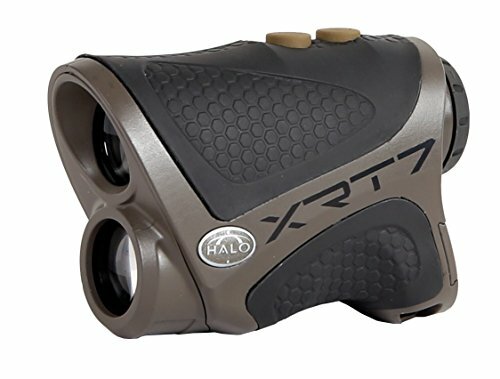 Capable of ranging targets out to 700 yards away, the HALO® XRT7 Laser Rangefinder offers a ± 1 yard precision reading for attaining hairsplitting accuracy. Boasting a 6X magnification and constantly ranging scan mode, the XRT7 incorporates AI Technology™ to compensate for slope to your target for an even more accurate ranging. Range your target with the HALO® XRT7 Laser Rangefinder and be able take your best shot.